What girl doesn't love pretty jewellery? There's something very special about receiving jewellery from a loved one whether it be for a birthday, Christmas or anniversary. Depending on your own personal style and preference you'll be naturally drawn to different pieces of jewellery. Some people prefer yellow gold whilst others stick to silver, white gold, or platinum. Some like a delicate, elegant and more classy look whilst others prefer chunky stand-out statement pieces. They say you can tell a lot about a person from their individual style and it would appear the same can be said about the jewellery you choose to wear. In fact, in line with this, Kigu Of London, have come up with a fantastic infographic which highlights the different charms and what they symbolise. I've always been a fan of charm bracelets and I was given one for a birthday several years ago. Over the many birthdays and Christmases I've had since, I've been gifted various charms and trinkets to further build my collection. Indeed I've got several charms now and it's safe to say that my bracelet weighs a significant amount! If you can tell a lot about a person from their charm bracelet then my own clearly represents love in every sense. Hearts feature heavily in my collection and you'd no doubt also be able to tell just from a glance that I'm a hugely sentimental person. The other great thing about my charms - as is the case with most - is their versatility. You can wear them on a bracelet or simply add them to a chain to wear as a pendant. One of the most common symbols in the jewellery industry, the heart, is also one that features on my own charm bracelet. Symbolising love, affection and passion, this is the perfect symbol if you're gifting jewellery to a partner or loved one. The Tree Of Life is another firm favourite of mine and I actually gifted a piece of jewellery to a friend which featured this symbol. A fan of yoga, everything natural, organic and being at peace or at one with the earth, the Tree Of Life was the perfect charm for Marie. If you have a similar friend then this is your go-to charm of choice. It also symbolises harmony, wisdom and healing. A locket charm is ideal if you want to give that extra personal touch by adding a photo. I actually received a heart locket from my boyfriend for Christmas last year. He'd known I'd been after one for ages since my Nanna's passing as I'd wanted a way to still carry her around with me. Needless to say I shed a few tears when I opened this gift and it couldn't have been more perfect. Guys who are looking to go all out romantic, - take note! Feathers can mean something different depending on who you ask. For instance, if you asked a spiritual or religious person such as myself, then I'd associate a feather with the presence of an angel. I like to think my Nanna is watching over me, indeed whenever I see a white feather fall nearby I always feel comforted. In other cultures a feather can simply be a symbol of good luck. A butterfly doesn't automatically look like it means anything symbolic and yet for many, a butterfly symbolises change. This is a great charm for anyone either facing or going through a big life change. Similar to the feather, the angel wing can be symbolic of angels watching over you. It's perfect for those who have been through or are going through a difficult time. Whether it be stress, upset, confusion or grief, the angel wing serves as a reminder that we each have a guardian angel and as such are not alone. If you're looking for a thoughtful gift then I'd highly recommend a charm bracelet. With Christmas not so long off, now is the time to start considering your options. 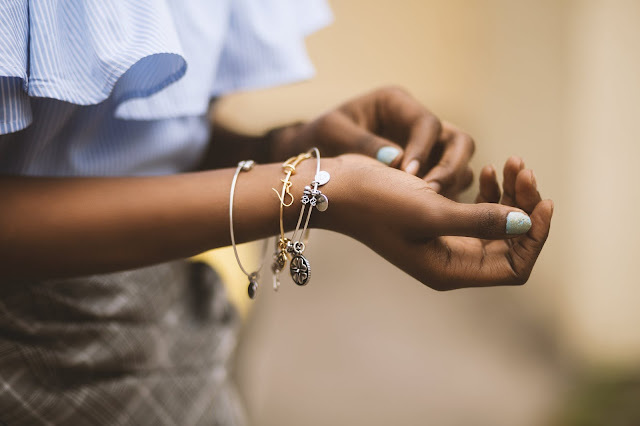 You could start the recipient off by giving them a bracelet and perhaps one or two charms and then they can further build their collection over a period of time. *Header photo via Pexels. Infographic courtesy of Kigu Of London.